Dental exams are necessary to gauge your oral health, identify the initial signs of oral cancer and ensure you do not end up with a painful and costly dental problem down the line. Meet with your dentist at least once every six months and this professional will have the opportunity to proactively analyze your dental health and put you on the track toward a beautiful and healthy mouth. People who do not visit a dentist will experience a variety of issues. People who skip a regular dental checkup only allow plaque on the teeth to build up and transition into tartar. Unfortunately, tartar is challenging to remove on your own with just floss and a toothbrush. The dentist's specialized tools are necessary to remove this nasty gunk before it wreaks havoc on your oral health. The bottom line is that it does not matter how thoroughly or frequently you brush and floss if you do not seek professional dental checkups. 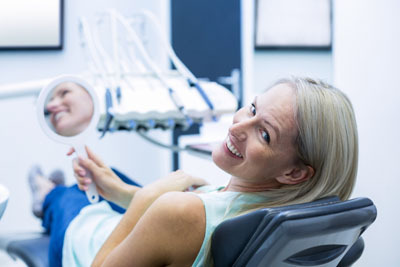 The assistance of a dentist is the only way to enjoy a comprehensive oral cleaning. It is awfully easy to forget about the gums. After all, they are concealed by the lips. Though your gums might not currently cause any type of discomfort, early-stage gum disease might be present. Those who fail to visit the dentist run the risk of gingivitis transitioning into a serious case of periodontal disease. If periodontal disease advances, tooth loss and bone loss can occur. This nightmare can be avoided by sticking to a regular schedule of visits to the dentist. A mouth that does not receive a professional checkup every six months or at least once every year will eventually be rife with cavities. The gradual accumulation of bacteria, food particles, plaque, tartar and other gunk in the mouth will slowly eat away at the enamel. Holes will form as the enamel wears away and become cavities. While we can fill diminutive cavities fairly easily, large cavities mandate extensive dental work ranging from crowns to root canals. People who do not visit their dentist on a regular basis run the risk of letting tiny cavities develop into large cavities. If your mouth has any cuts or abscesses, they can spread and eventually sustain an infection. The chances of such an infection are that much greater if you do not give the dentist a chance to inspect your mouth. In some cases, an X-ray is necessary to identify the presence of an abscess. As time progresses, more and more studies are connecting oral health to overall biological health. Those who fail to visit the dentist at least once every six months run the risk of an oral health problem going undetected and affecting other portions of the body beyond the mouth. Poor oral health links to all sorts of diseases and illnesses. The bottom line is you are jeopardizing your health by skipping your 6-month dental visits. For more information or to schedule an appointment with Ping Hai DDS,request an appointment in our Marietta dental office here: https://www.drhai.com. Or call us at (770) 239-2722.